Curriculum vitae is Latin meaning "course of life"
As I prepare for an interview to try and get accepted into m3 corp, it occurred to me that it would be nice if I had one spot where I could point and say "that is what I am about" like a resume or a CV. So I'm am going to write a post describing such things and then link it on the side bar near my name so I'll have a URL to give to people to say "there, that is me". I am a combat pilot specializing in Caldari Hybrid ships. I can fly all non-capital Caldari Tech 1 vessels and in the Tech 2 version I can operate proficiently in Frigate hulls and the HAC, HIC, and Recon classes. 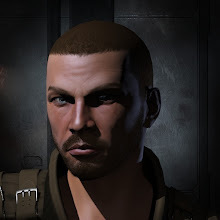 As well I am a Chimera Carrier pilot with good support skills for capital mods and fighters. I am capable of using all sizes of Tech 2 Hybrids (i.e. Railguns and Blasters) with very good support skills, and I can use Tech 2 Heavy and Heavy Assault missile systems with good support skills. I am also trained to level IV on all ECM skills. Currently I am training skills for Command Ships and Logistics cruisers. My full skill set can be seen here. I have participated in many areas of combat piloting in New Eden including extensive mission running for the Republic Fleet, low sec and null sec patroling in both individual and cooperative scenarios, null sec defensive operations, Factional Warfare for the Tribal Liberation Force to the rank of Venge Captain, exploration, and null sec pirate hunting (i.e. ratting). While I have done some illegal activities in my two years in New Eden space, it has never been my focus; I much prefer looking for a fight than a gank so to speak. Sept 2006 - Feb 2007 : Interstellar Privateers of Res Communis (Inactive) - Low sec (Placid) and null sec (Syndicate) small gang fighting, ratting. Attained rank of Director of Manufacturing. Feb 2007 - May 2007 : Strife Mercenaries Inc. (Inactive) - Empire war declarations, mercenary work, mission running. Rank of Director. May 2007 : No Quarter - null sec life in Venal, some exploration. May 2007 - July 2007 : Kodachi Enterprises - Solo mission running and some exploration in Molden Heath. CEO. July 2007 - Oct 2007 : Omen Incorporated / Coreli Corporation - Null sec small gang fighting, POS logisitics, and ratting in Fountain Region. Part of Exuro Mortis alliance. Oct 2007 - Nov 2007 : Interstellar Privateers of Res Communis (Inactive) - Low Sec solo hunting in Placid. Nov 2007 - Jan 2008 : m3 Corp - Low sec hunting in Essence, null sec ratting in Wicked Creek, mission running for Caldari Navy. Jan 2008 - May 2008 : Strife Mercenaries Inc (Inactive) - Low sec (Lonetrek) and null sec (Pure) small gang fighting, mission running, null sec life in Providence as part of Slyph Alliance followed by null sec life in Synidacte as part of Rejuvenate then Wrath alliances. Responsible for corporate POSes. Rank of Director. May 2008 - Sept 2008 : Katana Securities Incorporated / Insisto Armamentarium - Solo complex capturing in Factional Warfare for the Minmatar Republic followed by solo COSMOS and regular mission running to raise standings for high sec POS. 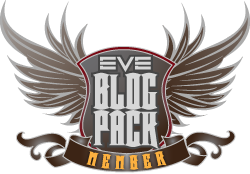 Oct 2008 - May 2009 : M3 Corporation (Blackwater Alliance) - Low sec combat, empire wars, null sec roams, some mission running. May 2009 - Present : M3 Corporation (Intrepid Crossing Alliance) - 0.0 warfare in Drone Regions. I have a second account on which I train the industrial character Derranna Elkadar who owns a Fenrir freighter and Nomad Jump Freighter and is capable of tech 2 production including all non-capital Caldari ships. 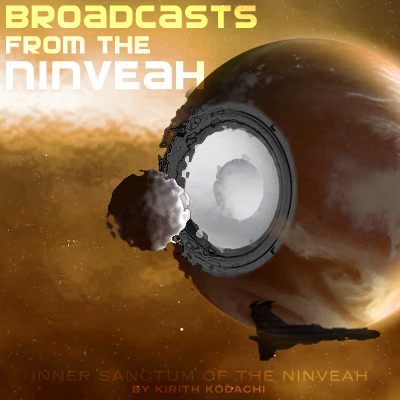 I write a blog called Inner Sanctum of the Ninveah in which I chronicle my Eve adventures. I also am a regular writer for the weekly news magazine Eve Tribune. Well, now I know what I have to shoot for over the next 6M+ skillpoints. Don't set the bar too high, dude.